The thought of a national title this season was the last thing anyone on the team could have imagined on December 8. The Lady Chaps had just lost 66-62 on the road to Cameron which marked their fourth loss in six games and dropped their overall record to 7-4 on the season. “We just sort of lost our identity for about three weeks of a struggle,” said Lubbock Christian head coach Steve Gomez. Starting point guard Caitlyn Cunyus had just returned from a broken ankle she suffered in early October and the team was suddenly struggling to find their roles. “That transition time of getting her (Cunyus) back into playing, it didn’t disrupt our team, but it sort of made some of the roles have to change a little bit,” Gomez said. 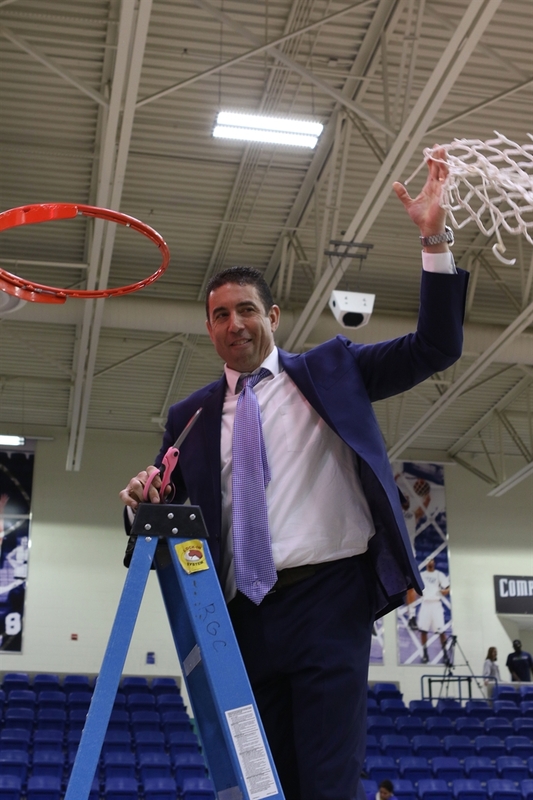 Despite the recent struggles the Lady Chaps had endured, Gomez was positive his team would make a run and be ready for the NCAA DII national tournament. Gomez was close. 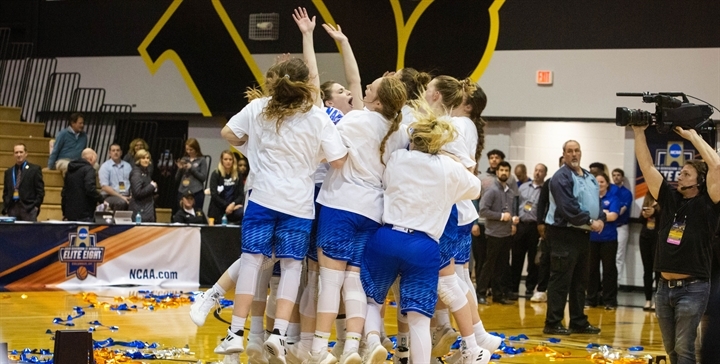 The Lady Chaps won 25 of their final 26 games on their way to winning the national title with the only loss being a controversial 69-67 loss on the road to Newman in Heartland Conference action. Lubbock Christian’s next two games following the loss to Cameron were in Bellingham, Wash. against two quality teams, Western Washington and Simon Fraser. The Lady Chaps left the state of Washington with two impressive victories. But it was the loss to Newman in conference play when Gomez saw a team that had matured and was ready to make a run in the tournament. The team could have blamed the loss on officials, instead they looked inward. Lubbock Christian spent the entire postseason fighting for respect from the NCAA selection committee. The Lady Chaps were a No. 3 seed in the South Central Regional and had to travel to Grand Junction, Colo. for the first two games of their regional. The Lady Chaps felt slighted once again after winning the South Central Regional when the NCAA gave them the No. 5 seed in the Elite 8. That left Lubbock Christian with a tough road to the finals. “This team fed itself better when they didn’t think they were the ones that everybody was expecting to win so I thought that was good to be in that middle seeding situation where we had nothing to lose and everything to prove,” Gomez said. The Lady Chaps certainly proved themselves and opened the Elite 8 with a dominating 99-54 win over No. 4 seed North Georgia. That set up a Final Four showdown with No. 1 seed and undefeated Drury. Lubbock Christian then defeated the Panthers, 69-60, to advance to the championship. The Lady Chaps faced a rematch in the finals against No. 2 seed Southwestern Oklahoma State, a team that had won 35 straight games and defeated LCU 77-75 during the Lady Chaps early season losing streak. Lubbock Christian won the title, but no team wins the championship without leaders. Olivia Robertson was leader the Lady Chaps needed. Gomez spoke glowingly of his senior from Kerrville Tivy High School who averaged 14.7 points, 6.3 rebounds, and 2.3 assists per game. Lubbock Christian also relied heavily on the inside play of Maddi Chitsey. Chitsey struggled early in the season and eventually lost her role in the starting lineup for the Lady Chaps. “She went through probably a month of just not playing good,” Gomez said. The junior from Wall, Texas is a kind-hearted individual who had to find her competitive fire. “She’s one of those kids that has a heart for the team, loves people, and I think she finally stopped playing apologetically and was willing to just be dominant,” Gomez said. Chitsey became dominant down the stretch as she averaged 13.8 points, 5.7 rebounds and 1.5 blocks per game for the Lady Chaps and nailed a crucial 3-pointer in the final seconds of the first overtime to send the game to the second and deciding overtime. Teams also don't win a national title without having some key role players who may not see much playing time or fill up the stat sheet. Julianna Robertson was a key member for the Lady Chaps. LCU may not have been in the Elite 8 without the younger Robertson as she had a huge block shot and a steal late in the South Central Regional semifinal against Colorado Mesa. The sophomore also drew a huge charge against Angelo State in the regional final to prevent the Belles from tying the game with under a minute to play. “Julianna Robertson, Olivia’s sister, was just huge for us in some games defensively just providing steals or rebounds or being in the right place,” Gomez said. Sophomore Ashton Duncan, whose father is the coach of the Lubbock Christian men’s basketball team, was another unsung hero for the Lady Chaps. “Ashton Duncan, she played some for us early in the year and next year we expect her to be really productive,” Gomez said. “Just the best attitude, energetic on the bench. Our bench players were as valuable as anything because they provided us so much energy and positivity and they’re just such unselfish kids. One will notice some common themes when looking at the Lubbock Christian roster. Many players are four-year players from West Texas high schools and have had success in high school with deep playoff runs or state championships. “To have Canyon girls, Nazareth girls, Wall girls, even Kerrville (Tivy), really that’s the whole key for us is getting kids that know what it takes to win," Gomez said. "They expect to win and when they get in these situations of championship environments they’ve been there and it’s not some new experience." When looking back on this season, Gomez will recall the struggle the Lady Chaps faced early in the season and how overcoming adversity is a huge part of life. “This is more realistic to life just what this team (went through)," Gomez said. "Going through struggle, going through adversity, this reflects most people’s lives. It’s not just undefeated life. You think through (problems), God where are you in this situation and he’s there all the time it’s just a matter of us opening our eyes.